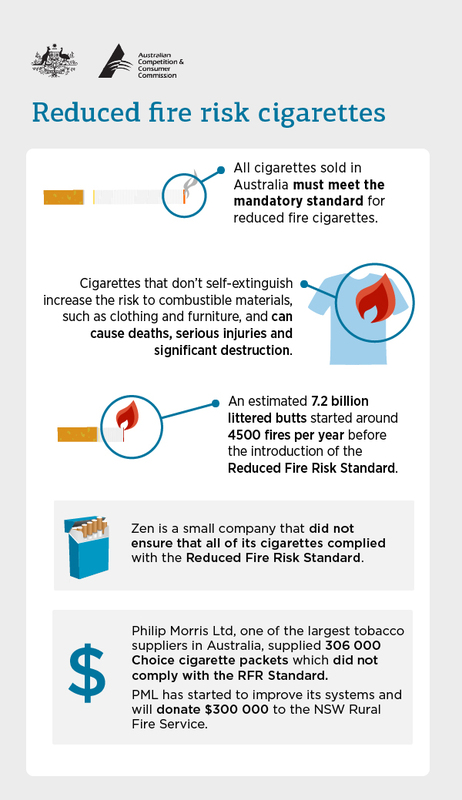 The Australian Competition and Consumer Commission has accepted court enforceable undertakings from both Philip Morris Ltd (Philip Morris) and Zen Sensation Pty Ltd (Zen) not to supply cigarettes that do not meet the mandatory Reduced Fire Risk safety standard. Philip Morris has also agreed to donate $300,000 to the NSW Rural Fire Service. “Cigarettes sold in Australia must meet the mandatory safety standard to self-extinguish when left unattended. Before the Reduced Fire Risk Standard was adopted, discarded cigarettes and related products started over 4,500 fires and killed an average of 14 people each year,” ACCC Chairman Rod Sims said. “Supplying products that do not comply with a mandatory safety standard is an offence under the Australian Consumer Law, and the ACCC will act swiftly to prevent harm to consumers,” Mr Sims said. An ACCC survey of compliance in the market place detected the unsafe cigarettes supplied by Zen. The ACCC had batches of TS Blue and TS Gold cigarettes supplied by Zen tested for compliance with the standard, and this testing showed that while some batches complied, others did not. Between October 2013 and July 2015, Zen supplied a total of 20 million TS Blue cigarettes and 4.5 million TS Gold cigarettes. Following contact from the ACCC, Zen commenced a voluntary recall of these cigarettes. Philip Morris self-reported its supply of non-compliant cigarettes to the ACCC and initiated a voluntary recall on 17 October 2015 after its test results confirmed the cigarettes did not comply with the Reduced Fire Risk Standard. Between 1 September 2015 and 14 October 2015, Philip Morris supplied 306,000 Choice Signature Bold and Choice Signature Classic cigarette packets that did not comply with the Reduced Fire Risk Standard. The mandatory Australian safety standard Trade Practices (Consumer Product Safety Standard) (Reduced Fire Risk Cigarettes) Regulations 2008 (Reduced Fire Risk Standard), requires that cigarettes are manufactured in a way that they will self-extinguish when left unattended. To meet the mandatory standard, cigarettes sold in Australia contain a concentric band of paper or other material, called the lowered permeability band, is included in, or applied to, cigarette paper in order to inhibit the burning of the cigarette. Last year Philip Morris supplied around 5.7 billion cigarettes in Australia. Zen supplied between 10 and 12.5 million cigarettes. Philip Morris self-reported to the ACCC and initiated a voluntary trade recall on 12 October 2015, and a voluntary recall on 17 October 2015 after its test results confirmed the cigarettes did not comply with the standard. The ACCC found that some batches of the Zen cigarettes passed and some failed. Zen also commenced a voluntary recall of the cigarettes it had supplied (TS Blue and TS Gold).